G.I. Joe is celebrating its 25th Anniversary of the Joe vs. Cobra fantasy. Hasbro has created a product line dedicated to fans devoted to the brand. The line is off to a great start this year, and the new figures are just now starting to show up in stores across the country. In order to keep that momentum going, Cool Toy Review and Hasbro have teamed up to find just who are the fan-favorite G.I. Joe characters from the past 25 years! 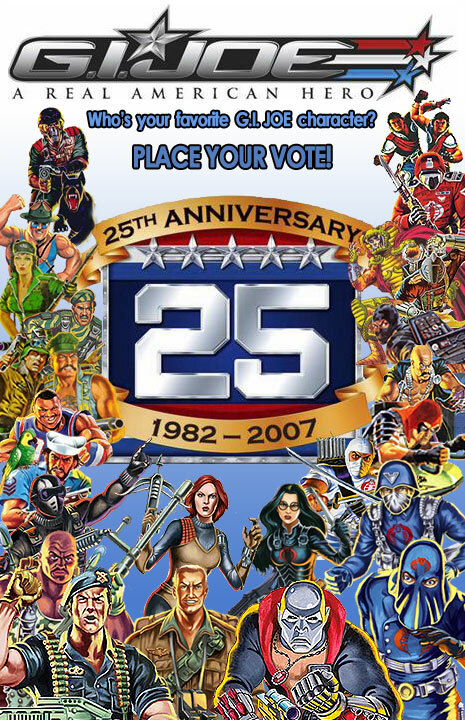 Will YOUR favorite characters be included in the new 25th Anniversary line? Not if you don't let your voice be heard! Thanks to all who voted and sent in their lists or posted in our forums! These results were sent to Hasbro, who were excited to see what that fans have chosen as their favorite G.I. Joe figures. As we've seen this weekend, many of the fans' favorites are already going to be included in the line, and the list above seems to fit in perfectly with their future plans. So now you know....and knowing is half the battle.